The Old Course at Nefyn is one of the United Kingdom's best kept secrets, and rivals almost anything in terms of its spectacular situation. A tiny promontory that juts out from the Lleyn Peninsula into the Irish Sea is the setting for ‘golf on the edge of the world', as Nefyn has been dubbed by many. Similarly to Old Head at Kinsale, Nefyn offers amazing sea views on three sides from the promontory, and keeping your eyes on the course in front of you can be the biggest challenge. Originally a nine hole course, Nefyn was extended by the revered duo of James Braid and J.H. Taylor, and now boasts 26 holes. Unusually, Nefyn has a standard outward ten holes, and two different inward sets of 8 holes, which adds much to the experience. 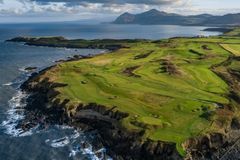 Heather, blind drives and devilish bunkers are among the hazards that await the hardy Nefyn golfer, who on a clear day may be able to spot the peaks of the Wicklow Mountains across the Irish Sea. There are few more amazing places to enjoy links golf in the UK, so make Nefyn and District's Old Course a priority on your next golf tour in Wales. Fantastic golf course, some of the greens on the Old Course on the Point had obviously suffered a bit from the very hot Summer, but overall, the course was in great condition. Golf Pro really helpful in getting us an earlier Tee Time. Unfortunately, we were playing in front of a Society who seemed to want to hastle us from behind, was very disappointed with the attitude of some of them making unnecessary, unpleasant comments on the Tee, especially as my Brother is 82yrs old and not as quick as he once was. Having said that, it didn’t spoil our overall experience on this great course and would definitely play there again.